In helping connect employees around the world, teleconferencing helps save time, money and the environment, and also promotes more efficient working practices. As the increasingly globalised business world has pushed colleagues, clients and associates further and further apart, there has been a greater need for technology to keep individuals connected without the need of everyone being in the same place at the same time. The technological world has attempted to address this problem with teleconferencing, which literally means ‘conference at a distance’. With the aid of telecommunications equipment, participants in different locations can participate in business meetings, training sessions, presentations etc. Initially teleconferencing was a solely audio affair with a telephone network providing the link between separate parties. Availability, ease of use and relative low cost made it a big hit with businesses. Companies no longer needed to waste so much of their valuable time and funds on business travel, and so were better able to focus on the job at hand. Audio teleconferencing connects three or more people in a single telephone call. No special devices are required beyond a regular telephone, which could be on a participant’s desk, at home, in a hotel, or a mobile phone. 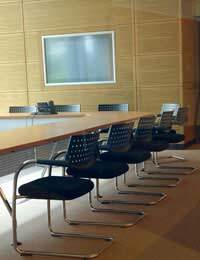 For groups of people sitting around a meeting table, special loud speaker conference phones are available to connect with parties not in attendance. Audio teleconferencing services take two main different forms – attended or unattended. With an attended service, you give the details of your conference to a teleconferencing supplier who then sets one up on your behalf. The cheaper unattended option means users set up and manage the conference themselves using the Internet. Nevertheless, in only being able to communicate via audio, the basic teleconferencing was always going to be limited. It’s ideal for solely discussion-based meetings but if visual aids anymore advanced than an agenda and minutes are required then the medium starts to show its deficiencies. Advancements in computer technology have help meet bigger demands and in doing so redefined the term teleconferencing. With the aid of web and video facilities, participants can not only talk to their far flung associates but also share video, designs, presentations and other multimedia experiences. The technology required to set up such a conference is now within the means of smaller companies. It is possible for anyone to set up basic group video conferencing online with the aid of a webcam and programmes like FlashMeeting or Apple’s iSight and iChat, or the new generation of free and easy to use browser based facilities from start-ups like dimdim.com. For more high-quality and secure operations, companies can opt for more advanced business orientated systems like WebEx. This software solution allows up to six people around the globe to join in the conference – with their faces appearing on screen – and respond to a group leader who might, for example, put a spreadsheet up on screen for them to work on live. In facilitating 100,000 meetings a day, it is clearly satisfying the needs of the market the way audio teleconferencing has done, but at around £190 a month it is a costly solution. The money saved from reduced business travel can be used to pay for such technological investment. Alternatively there are companies that offer conferencing services on a bureau basis, with users renting both time and equipment from the supplier. Whilst there are numerous benefits to teleconferencing there are inevitably a few disadvantages. Firstly technical failures can occur when a conference is being established or whilst it is in progress, which can disrupt the whole event. Secondly but more importantly, however advanced teleconferencing becomes it’s unlikely to be able to replace the human of a face-to-face meeting. Important first impression meetings should therefore take place in person and not over the phone or on a screen.